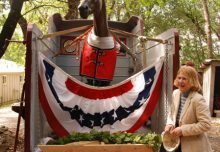 Pam Berg was taking donations for her Glen Ellen horse sanctuary at Bay Meadows on Saturday when a visibly upset woman came forward with money in memory of Eight Belles. Berg said she no longer watches horse races, having witnessed one too many fatalities during her 18-year tenure as an official steward at California race tracks. Many can relate to that feeling following Saturday’s stomach-churning spectacle, in which millions watched from the stands and on live TV as another celebrated horse suffered a horrific injury and had to be put down. As was the case after Barbaro’s injury at the 2006 Preakness Stakes and his death eight months later, people are again debating the safety of a sport some laud for its pageantry and aestheticism, and others denounce for what they view as cruelty. One thing is for sure: After Saturday’s sad events, some are going to view the upcoming Preakness Stakes in two weeks as they would a horror movie, waiting for something bad to happen. That’s not good for a sport that already was struggling from the public relations debacle of Barbaro’s high-profile death. “People watch NASCAR for the crashes. They don’t watch horse racing for that,” said Rick Arthur, the equine medical director for the California Horse Racing Board and a native of Santa Rosa. More than 7,500 racehorses were hurt or killed in California in the past decade, including 301 fatalities in the season that ended in November. That included five deaths during last summer’s Sonoma County Fair — three while racing, one during training and another of other causes, according to racing board statistics. In the wake of Barbaro’s death, California’s five major racetracks had to install synthetic track surfaces by the end of 2007 to try to prevent injuries. It appears to be working. Arthur said the number of catastrophic injuries has been cut in half since the installation of the new materials. It remains to be seen whether Eight Belles’ death will lead to any changes in the sport. 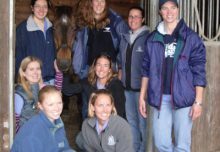 From a medical standpoint, the filly’s injuries were so unusual that experts two days later still were trying to figure out how they could have happened. The horse broke both front ankles while galloping out a quarter-mile past the finish line. Some have theorized that she broke one ankle and then the other as she transferred her weight. A half-ton racehorse’s lower leg bones are about as thick as a human wrist, and at full speed, each foot hits the ground separately, momentarily bearing a tremendous load. Arthur, who reviews all race-related horse deaths in California, said he’s never seen anything like it in his years associated with the sport. He agreed with the decision to euthanize the horse on the spot, saying there would be no way to stabilize the broken ankles so that the animal could stand up. Simply keeping her on her side was not an option as her own weight would damage her muscles, he said. The calls for Churchill Downs to switch from dirt to synthetic material may grow louder in the wake of Eight Belles’ death, although it is believed to be the first fatality during a running of the Kentucky Derby since the 1930s. “I expect to watch the Kentucky Derby and not see another catastrophic injury in my lifetime,” Arthur said. The Santa Rosa track is exempted from the synthetic rule because its race season is fewer than 30 days. Jack DeMeo, a Santa Rosa attorney who’s owned Thoroughbred horses for 40 years, questioned the decision to run a filly in Saturday’s Derby against generally stronger and faster males. People for the Ethical Treatment of Animals have called for sanctions against Eight Belles’ jockey for allegedly whipping the animal to excess. The Humane Society of the United States on Monday released a statement arguing that horses are becoming more fragile because they’re being bred for speed, not durability. Berg believes owners should wait until horses are 3 years old before racing them. That’s a year later than when a lot of horses hit the track. She also advocated a shorter racing season to give horses more time for rest. But DeMeo, who was present at a Breeders Cup in the early ’90s when five horses were put down during a series of races throughout the day, said the risks that are inherent in horse racing are no different from playing football or even driving a car.